With the sun beginning to peek out more as the weather warms up, sun damage and skin cancer are becoming more of a risk. While you should wear sun protection throughout the entire year, it is really important to wear it during the spring and summer. With so many thick and sticky formulas, it can be difficult to find a sunscreen for face under makeup. Here are our 10 picks for the best sunscreen to wear under makeup. All of the products listed provide UVA and UVB protection, and they ranked according to customer reviews. Read through to find your match for best sunscreen to wear under makeup. The first item on the list is a super moisturizing formula from Biore. The waterproof formula includes ingredients such as citrus mix and hyaluronic acid to boost the hydrating effects while also providing premium sun protection. The product does include alcohol, which can be drying and harmful, so be mindful of that if you have sensitive skin. Many reviewers loved the fact that the sunscreen was non-greasy and was very easy to wear under makeup. If you have acne, then the Neutrogena Clear Face Liquid Lotion Sunscreen might be a good option for you. This sunblock is specially formulated for acne-prone skin, so it is non-comedogenic, meaning it will not clog pores or cause any breakouts. It has a “water-light” texture that will not add unnecessary oil to your face, and it gives a matte and weightless finish. Next on the list of best sunscreen to wear under makeup is another product from Neutrogena and is recommended by the Skin Cancer Foundation. 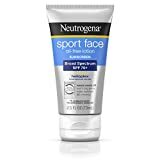 The Neutrogena Ultimate Sport Face Oil-Free Lotion Sunscreen is non-comedogenic, leaving your pores clear. It also resists wear off caused by rubbing, sweat, and water. It is a great option for more active wearers or for people in hotter, sweat-inducing climates. 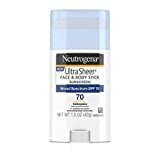 For those of you who hate the mess of applying sunscreen, you may be interested in using a “sunscreen stick.” The Neutrogena Ultra Sheer Face & Body Stick Sunscreen gives you the luxury of a quick and hands-free application. It is also versatile as you can use it on both your face and your body. The stick is a past winner of the Allure Best of Beauty award for Best Sunscreen, and the vast majority of feedback supports that, calling it the best sunblock to wear under makeup. 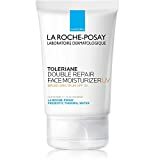 If you’re looking for a sunblock with positive skin benefits besides sun protection, then try the La Rocha-Posay Toleriane Double Repair Face Moisturizer. The product has SPF 30 and works well even with sensitive skin. It is non-comedogenic and works to repair the skin barrier within 1 hour of wear, protecting skin from harmful substances in the air like bacteria and allergens. Many past users loved the moisture that the lotion gave them, but cautioned people with sensitive skin against using it. A healthy skin barrier also retains moisture better and promotes your go-to skincare products. Don’t let the name fool you, this sunscreen works great for both little ones and adults. Because of its gentle, “safe enough for babies” formula, it works great for those with sensitive skin. 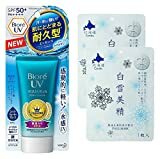 The sunscreen is made up from a natural oil blend made from different seeds including tomato and sunflower, which have natural sun protecting properties. It also is not tested on animals, making it a great option for socially conscious shoppers. 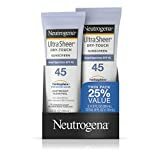 This sunblock utilizes Neutrogena’s Dry-Touch technology, leaving a smooth and matte finish that is undetectable to the touch or the eye. According to reviews, the Dry Touch technology left an invisible layer for people with darker toned skin as well. Even with its super light formula, it is water resistant. It will not clog pores and is oil free, so it is great for those with acne-prone or oily skin. This one is quite possibly the best matte sunscreen under makeup. The first runner-up for best sunscreen to wear under makeup is another waterproof formula. The Coppertone Sport Sunscreen contains extra moisturizers and Vitamin E to keep skin supple and hydrated. The formula is durable and long-lasting, but it remains breathable and light-weight. While some reviews were critical of the smell, they spoke highly of its sun-blocking abilities. The sunblock also comes in various sizes to fit whatever needs you may have. The title for best sunscreen to wear under makeup goes to the Thinkbaby Safe Sunscreen. The formula is mineral-based, meaning it is free of the biologically harmful chemicals found in many other sunblocks. It won more awards than any other suncare line, with the Allure “Best of” list on its resume. This sunscreen is also the first sunscreen to pass Whole Foods Premium Care requirements since it includes safer, more natural ingredients. Customers raved about its beautiful scent and its smooth application. It’s a non-oily sunscreen that applies easily and smoothly, offering premium protection. One of the most important things you can do for your skin is to protect it from harmful sun rays. Sunblock can add an unpleasant and thick layer to your skincare routine, but there are plenty of options that are comfortable, even under makeup. Do you have a pick for the best sunscreen to wear under makeup? Have you ever tried any of the products on the list? Let us know what you think about our picks in the comments section below!